1. Time; took a lot of time but it finally stopped hurting. 2. Avoiding sitting back in any chair. Lean forward, sit sideways or put something under one sitz bone. 1. a bed pillow to sit on. Worse than the wooden seats we had in 3rd grade. 2. a rolled up towel under the sitz bones. 3.a ring or donut pillow. 4. Pain meds. They just prolong the healing process, because you may not pay attention to your sitting habits, and keep irritating it. 5. Assuming that random doctors know the best way to treat it. They don't. 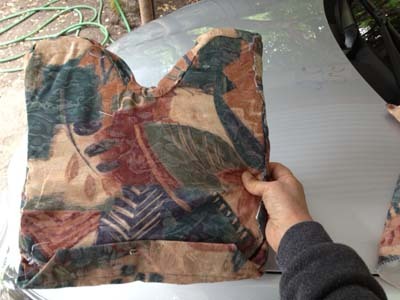 I had a major flare-up when I was about 35, that lasted for many years and was due to the car seat. During those years I finally figured out the answer to the problem. It's the best and only treatment, and it's not expensive: make yourself a seat cushion with the middle of the back cut out. The shape is square, with a U-shaped cut-out in the back. The cutout keeps your coccygeal area completely off the seat. It must support your sitz bones (isheal tuberosity). You need to feel exactly where your sitz bones are while you're sitting. I measured the distance between mine, so I didn't cut out too wide a "U". Make the cushion out of dense foam, insulite etc. The front should be tapered down to ~1/2", and the back may be as high as 4", depending on the angle of the offending seat. If the seat is at a 90 degree angle from the chair back, you would need less height at the back of the cushion, or perhaps the cushion pictured by Reed. If the seat is a soft material, you need more height in the back of the cushion. The purpose is to get enough height in the cushion that there will be nothing touching your coccygeal area when you're sitting on it. Nothing. When constructing the cushion, try it out multiple times to make it is just right. 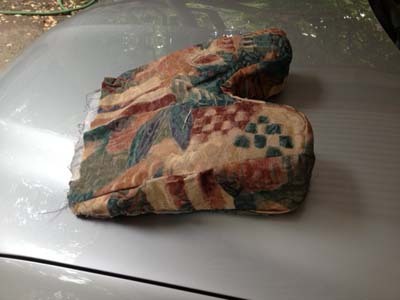 My cushion, pictured here, was made for the seat in my sports car; the seat front is quite a bit higher than the back. As an aside, after having that car for a year, I developed marked bilateral hip pain, which the doctor chalked up to "age". And which completely disappeared with the cushion I made. 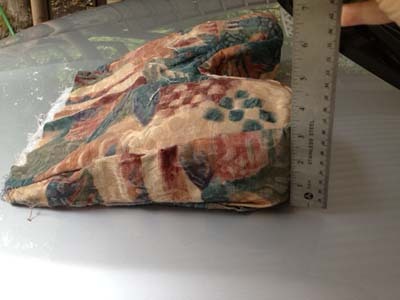 Use your custom made cushion in cars, airline seats, everywhere. Email me if you have questions.